The latest tools of the City of Seattle, Find-It/Fix-It walks, were designed to have regular citizens meet their city leaders, to chat with police officers, and to point out things like graffiti and trash. Those need to be pointed out because, obviously, no one from the City has noticed these things recently. These walks were designed to assuage the fears of people living and working in South Seattle. To show that city leaders were indeed paying attention. Attention to the fact that, since April 19, more people have been killed in the 37th Legislative District, which South Seattle dominates, than in the War in Afghanistan. Attention to the fact that, while violent crime has fallen city-wide, gun violence in the South Precinct is up 165 percent over all of 2013. Attention to the fact that the South Precinct has its 8th new police captain in five years. Attention to the fact that 75 percent of robberies in the South Precinct occur within 250 feet of transit stations, and that robberies are way, way up. On Tuesday, Seattle Mayor Ed Murray joined in the fifth “Find-It/Fix-It” walk, the second in the Rainier Beach area. It was gratifying to see the Mayor in the neighborhood, especially since he missed the July 22nd Rainier Beach event. 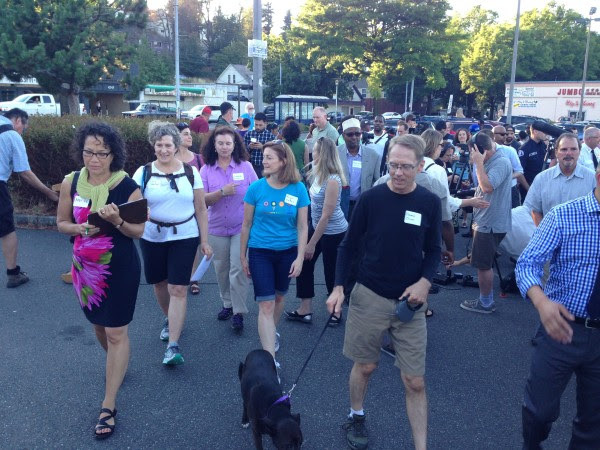 Tuesday’s walk was also attended by Councilmember Sally Clark (a resident of the Brighton neighborhood), and Seattle City Attorney Pete Holmes (who lives south of Seward Park). Councilmember Bruce Harrell, a lifelong resident of South Seattle, participated in the first three walks. But residents of South Seattle should be very concerned that none of the other seven members of the Seattle City Council have bothered to show up at the Find-it/Fix-It walks. Not the only member who served as a police officer. Not the only member who served as a Deputy King County Prosecutor. Not the Vice Chair of the Public Safety Committee. Of the 80 people participating in Tuesday’s walk, more than half are paid city employees, representing the departments of police and fire, parks, neighborhoods, transportation, and lots of young interns and junior staff from the Mayor’s office. It was uplifting to show such a huge city contingent that the Seattle city limits extend beyond McClellan Street. Welcome to Rainier Beach, Mr. Mayor. One could be forgiven for being skeptical that these walks would accomplish much. Since the first Rainier Beach walk two weeks ago, we’ve had numerous drive-by shootings, the home break-in and sexual assault of a child, and the pistol-whipping of a young woman in the Rainier Beach Public Library. Within hours of the Find-it/Fix-It walk around the Genesee Station, teen girls were robbed at gunpoint. More shootings here, there, everywhere in South Seattle. Refreshingly, newly-hired Police Chief Kathleen O’Toole walked side-by-side with real neighbors genuinely excited by her presence. But while it was great to rub elbows with police brass, there was a disturbing disconnect. Capt. John Hayes seemingly wanted to fill Robin Williams’ void by serving as jovial entertainer-in-chief. If he was describing, at any point, the violence that occurred in our library a few hours earlier, it wasn’t apparent because his demeanor was nothing but casual and flip. DJ, play me some Bobby McFerrin. “I don’t (expletive) care,” I exploded in exasperation at her arrogant, let-them-eat-cake attitude. “Take care of it! Look at this bleeding girl and a fallen blind man; this is a hazard that needs to be fixed.” She argued with me, sputtering excuse after excuse why SDOT couldn’t help. Worse, with a straight face, she said that Rainier Beach gets the same resources as Queen Anne. And so goes the denial; so the lies are framed. It’s one thing to ignore problems in South Seattle, as city leaders have done recently. But to take us on a stroll around a neighborhood, acting as if all is under control, as our city leaders praise their own responsiveness, is simply a Dog & Pony Show. We need the promised increase in police presence; we need those officers out of their cars and meeting youth and families; we need city administrators who won’t make excuses and will make progress; we need elected leaders who care as much about South Seattle as they do about South Lake Union. Cindi Laws is a resident of the Rainier View neighborhood and a long-time activist. I’m shocked at what the SDOT representative said about brambles overgrowing the public sidewalk. Vegetation obstructing the public sidewalk is unlawful, and it’s enforced by the Department of Planning and Development. SDOT staff should know that! Call them at 615-0808 to initiate enforcement action. I learned via a Freedom of Information Request that roughly 75% of all city employees live outside Seattle. It goes a long way to explaining why some city staff members don’t know Seattle ordinances. It also goes a long way in understanding why we are so neglected in South Seattle – a fair number of city employees don’t care because it doesn’t impact them personally. TO BE CLEAR, there are many wonderful city employees, regardless of where they live, that work very hard and care a great deal. Shouldn’t we be keeping our $15/hour jobs in-house?